Android TV Sticks, the time is now! Potentially the future of how we surf the web while sat on the couch. Android TV Sticks (aka Android Mini PCs, aka Android TV Dongles) are about the size and shape of an overfed USB flash drive but they don’t just store files. They’re actually tiny computers in themselves that run an Android operating system, generally version 4.2, and accept input from USB, SD cards and Bluetooth devices like mice, keyboards and gamepads. 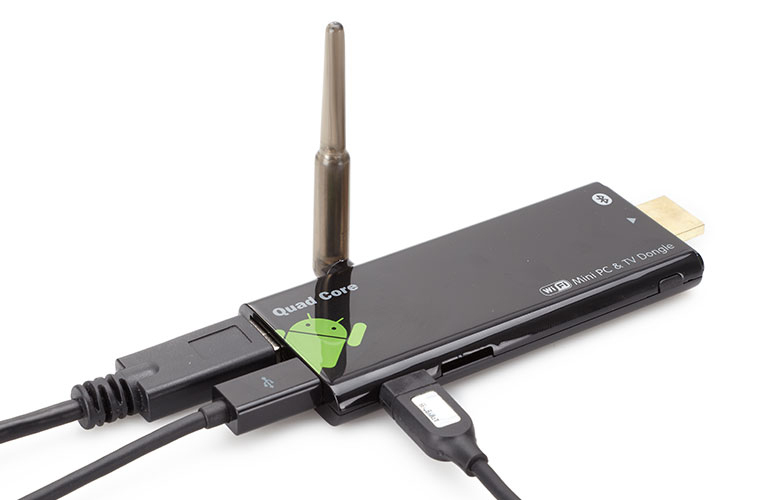 Plug the stick into your TV via the HDMI port and you can run Android apps on the big screen. To clarify they’re essentially powerful phones/tablets without the display (which is the expensive bit) making them really cheap, around $70. The thumb sized MK802, was first brought to market in May 2012 but I held back as the hardware was pretty underwhelming for the work the device would have to do. But that’s changed with the very recently released quad-core processor models (think 4 brains instead of 1) capable of outputting Full HD display smoothly and powering through graphically intensive games. So why is that cool? Well think about the apps out there on Google play, you have Facebook & Twitter, Netflix, VLC & MX Player, Spotify, Apollo & Double Twist, Youtube, Chrome & Firefox, Quickoffice NOT TO MENTION ALL THE GAMES THAT ARE FREE TO PLAY!!! This magical little box turns your TV into a web browser, media player and games console (and if you like looking at spread sheets and word docs on a screen while sat across the room, you can use it for the traditional boring PC stuff too). You’re effectively making your TV smart (really smart) without spending the extra few thousand clams. And think about this, your big flat screen full HD TV is a capital purchase, that bad boy is going to be bolted to your living room wall for a few years at least. But computers stop being at the forefront of technology within a couple of weeks. Spend a small fortune on a Smart TV and by the end of the year it’ll probably start to seem pretty stupid. But, so far, Android TV Sticks have proven to be so cheap you can get the next model in six months time which will probably have doubled in brain power. I’m already looking forward to getting my hands on one of the next octa-core models. So why haven’t you heard of these awesome little contraptions before? Currently there is lack of big player interest from the likes of Google, Samsung, LG etc. (If anything these relatively new and mysterious devices work against the product portfolios of the big boys). Production is cornered mainly by little known or unnamed Chinese manufacturers, shrouded in oriental mystery . . . for legal reasons . . . using the Chinese rockchip processor. Some of the devices don’t even ship with any branding. Possibly a legal thing (the eyes of g-oo-gle are ever watchful) or perhaps the manufactures just want to pass the savings of sparse branding onto the customer. Some company names you may have heard batted about though (if you hang out with tech nerds) are Rikomagic and Tronsmart which would be considered reputable (by said nerds). Another possible reason you might not have heard of these “things” is nobody seems to know what to call them! So here’s my attempt at making a name stick (WORD PLAY! ), Android TV Sticks, shall be henceforth known as A.T.S’s. A.T.S. sounds kinda like TV jargon don’t ya think? Like VHS, DVD or AV cable. I got a new 4.4 ATS. The video playback on this new ATS model is awesome. I’ve put my old ATS in the microwave to see if it explodes. So you may have heard of the Google Chromecast, so what’s the difference? Although visually similar, Chromecast and Android sticks have little in common. The Chromecast is simply a receiver. It enables you to transmit/mirror your Chrome tab from your computer or broadcast certain apps from your Android or iOS device to your TV. The Chromecasts currently retail at around $35 and the ATS’s start at around $70 but if you’re thinking the ATS’s are expensive by comparison you’re forgetting you’re getting an entirely separate computer you can use independently. It would be like comparing the price of a set of tyres to the price of car. In the same way tyres don’t get you from A to B without the rest of the vehicle the chromecast displays nothing unless you have a device to transmit to it. I think ATS’s make a pretty compelling argument for themselves. If you have a few clams to spare and you know how to set up an android phone you should give one a try.